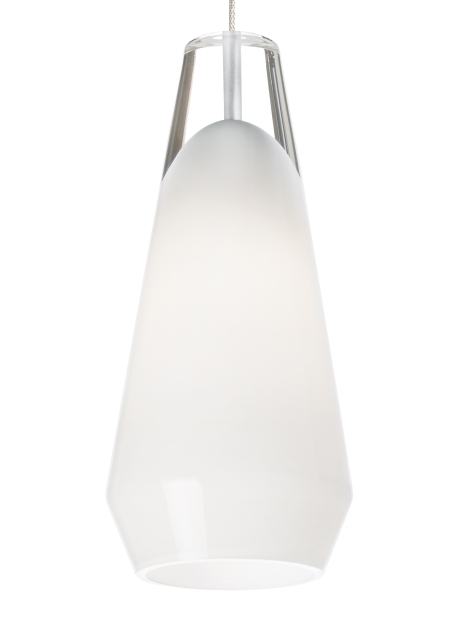 The Lustra pendant light from Tech Lighting is inspired by the classic crystal tear drops on traditional chandeliers. Unlike classic chandeliers though the Lustra utilizes pure optic crystal that’s been hand-cut to create a dual faceted light fixture. This elegantly designed contemporary fixture is available in two distinct finishes, Smoke and White and comes in three on-trend finish options. Although modest in scale the Lustra Pendant is powerful enough the provide ample lighting in places such as kitchens, bedrooms and dining rooms. For even greater design customization pair the Lustra with one of our mulitport canopies for a custom chandelier design or hang from one of three of multipurpose rail systems. Your choice of Halogen or LED lamping ships with the Lustra. all lamping are fully dimmable to create the desired ambiance in your unique space. Includes low-voltage, 35 watt halogen bi-pin lamp or 8 watt, 300 delivered lumen, 3000K, replaceable SORAA® LED module and six feet of field-cuttable cable. Dimmable with low-voltage electronic or magnetic dimmer (based on the transformer).